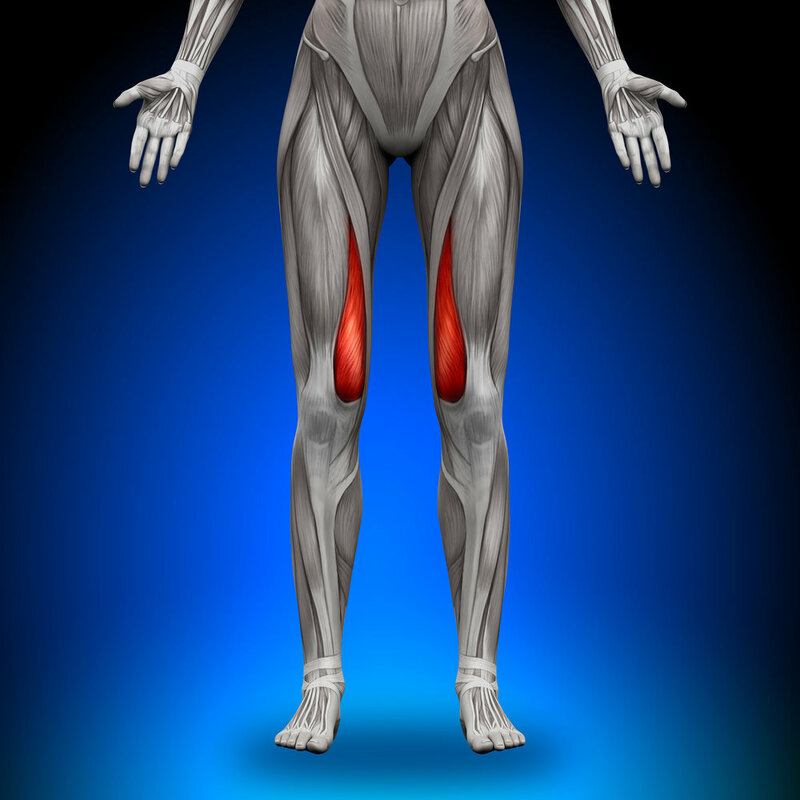 Vastus medialis, or the "tear drop" muscle, is shown in red. A friend, who regularly runs several miles each week, experienced intense cramping along the "tear-drop" shaped muscle on the front of her thigh (the Vastus Medialis, a quadricep muscle). She asked me for ways to lessen the chance of cramps recurring. She mentioned increasing her waster and sodium intake before her runs and after them; unfortunately, this didn't prevent cramping. We talked about the quadriceps and how they enable or support certain movements (e.g., primarily extending and stabilizing the knee with one quadricep, Rectus femoris, playing a role in movements at the hip joint). We also reviewed ways to stretch the quads. Later, her question led me to search for more evidence supporting a specific approach to avoiding muscle cramps. 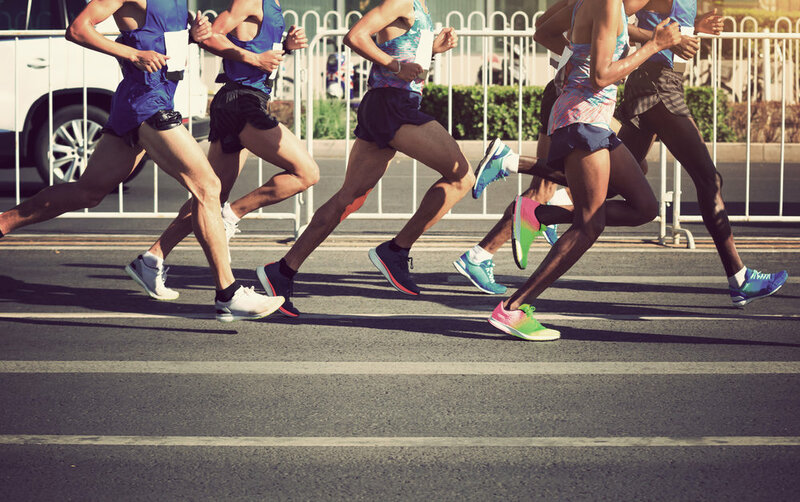 In the journal, Sports Medicine - Open, I found a study comparing ultra marathoners (i.e., 161 km race runners) who experienced muscle cramps to those who did not. The study considered water and sodium intake. The results showed those with a history of muscle cramps were the ones who experienced muscle cramps during the race. Although their water and sodium intake may have been comparable to those who did not experience cramps, the muscle cramps reoccured in persons who had previously experienced cramps. Sports Medicine - Open also has other research supporting this conclusion for those participating in ultra marathons which may take up to 30 hours to complete (e.g., "Sodium Intake During an Ultramarathon Does Not Prevent Muscle Cramping, Dehydration, Hyponatremia, or Nausea"). An article, "Muscle Cramps and Diuretic Therapy," in the Journal of Clinical Hypertension focuses on muscle cramps which commonly occur in medical patients and particularly the elderly. The article notes sometimes an electrolyte imbalance cannot be directly associated with cramps. In these instances, stretching is recommended. Although it may not help with muscle cramps, I aim to drink at least 64 ounces of water daily because it helps on other physiological levels. And I'm a big proponent of stretching, especially when you're asking your body to cover several miles each week. I found Coach E's blog post, "The Only 3 Quadricep Stretches You Need for Flexible Quads" to be very informative and effective. The stretches combined with increased awareness of how we use our quads may help prevent or reduce muscle cramps. Thumbnail image courtesy of Francesco Gallarotti.